It’s not uncommon for would-be expats to Malta to ask us where’s best to live when they move here. Typically, they ask for an overview of property, whether it’s best to buy or rent, and for a low-down on the des-res areas. Malta’s main coastal resorts, in particular St Julian’s, tend to be firm favourites for expats, but why exactly? Here, Dragana Rankovic, an expat herself, now helping others to find their ideal new home on the islands, provides a helpful guide to property and lifestyle in St Julian’s. St Julian’s, located on the north-eastern coast of Malta is a popular living area that caters to tourists, expats and locals alike. Because Malta is an all-year-round holiday destination, St Julian’s is a town that is just as alive and dynamic in the winter as it is in summer. Despite being such a popular district, St Julian’s still retains a peaceful quality and its charm. Today, St Julian’s sits snugly around a bay with its colorful Maltese luzzus giving a hint as to the traditional focus of the town. A walk along the seafront shows St Julian’s contemporary face with its restaurants, souvenir shops and boutiques. Don’t be deceived into thinking it’s just an expat-tourist area though as locals also enjoy the benefits of this lively resort. In 1854, there were just 600 residents of the town whereas today that figure is almost 8,000, creating a strong sense of community into this rocky inlet that was once a sleepy backwater. Even though St Julian’s boasts many restaurants, bars and nightclubs, it also manages to offer a safe retreat for residents who live and work in this area. From families to retired couples, St Julian’s really does have something for everyone. Where to live in St Julian’sSt Julian’s is a multi-faceted town which manages to fit together its various offers quite nicely. Deciding where you want to live in St Julian’s depends on what you are looking for and which ‘face’ of St Julian’s appeals most. From new developments and penthouses to residential houses and apartments, there’s a location to suit, regardless of whether you wish to rent, buy or let a property in Malta. This makes St Julian’s a lucrative area for fledgling landlords and experienced property moguls looking to invest. The areas around Paceville after the war were mostly farming communities surrounded with fields, and Paceville itself only had a few restaurants. Unlike today, parking in Paceville was relatively straightforward as people used to park their cars in fields, one of them being the field on which the St. George’s Park hotel was built. Paceville’s slow transition into a tourist hub commenced in the 1960s, when two major hotel corporations, the Sheraton and the Hilton, developed five-star hotel properties in the area. Paceville offers great opportunities for investors who want to buy apartments for holiday lets as well as for young couples and professionals who either want to rent or buy property in Paceville. 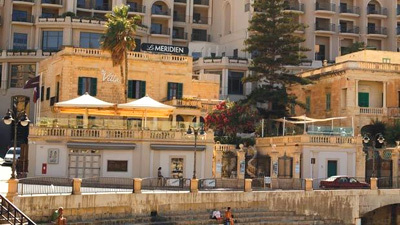 Portomaso is one of the main new developments in Malta which offers luxurious residential accommodation overlooking the marina and which also provides a leisure centre, a beach club, shops, a Hilton hotel and a conference centre. It is here that you’ll find Malta’s only skyscraper, Portomaso Business Tower; coming in at 98m it houses a club on level Twenty Two. Pender Gardens is another popular lifestyle development in St Julian’s, which offers a wide variety of residential and commercial property. With access to a fitness centre, pool and car park, apartments in Pender Gardens are highly sought after by both investors and residents looking to rent, buy or sale property in Malta. Swieqi is close enough to Paceville to take advantage of the many amenities and events on offer, but far enough away to offer a quiet, peaceful residential environment. There are many great properties available for rent in this easily accessible location. Public transport into Valletta and other parts of Malta is excellent and one of the park and ride schemes is located here. Properties in Swieqi include maisonettes, apartments and terraced homes. Madliena is another desirable area near Swieqi-St Julian’s and rumored to be the place where Mary Magdalene was shipwrecked. Madliena is undergoing development with Madliena Village; a number of luxury apartments offering superb sea views are being developed nearby, along with high-end properties in Madliena Ridge. Such interest is turning this quiet village into one of the most sought after areas to live in Malta. Spinola Bay lies on the other side of St Julian’s and encompasses the traditional quiet bay with its luzzus and fishermen. There are still plenty of cafes, bars and restaurants, but the pace of life here is quieter and more conducive to those who wish to dine al fresco with a bottle of wine watching the sun sink over the horizon. This is the place where retirees find their escape and there are more traditional Maltese properties to be found in this region. Buses are plentiful in this district with several routes going to Sliema, Valletta and Paceville and stopping at various locations along the way, although they might operate a lighter schedule in the winter. There are also night buses on at the weekends and buses to the airport. The new park and ride in Swieqi is also a handy way to get into town without worrying about parking. There are several taxi companies too, but these can be an expensive option unless you’re sharing. The most popular school in St Julian’s is the Sacred Heart Foundation which runs both a primary school and a senior school for girls. There is a good mix of local and expatriate children here and lessons are primarily in English. There is also the St Vincent School on St Julian’s Hill and a few public schools as well as a huge scattering of English language schools. Even if the locality doesn’t have the school of your choice, Maltese schools all over the islands are within striking distance; all run minivan transport for pupils at a reasonable rate per term. There is always something to do in St Julian’s. The Spinola Palace Gardens offer a quiet retreat during the day with breathtaking views. Portomaso marina is full of luxury yachts, restaurants and bars and from here you can get to the beach which is popular in summer with sunbathers and swimmers. For shops you need to head to Bay Street which also offers large-screen and an IMAX cinemas and a bowling alley. It was the closest Malta had to a shopping mall before The Point in Sliema, and you can get most things here from household goods to clothing. For supermarkets there is an Arkadia supermarket beneath the Hilton Hotel. However most of the local butchers and grocers often have cheaper deals and can be fresher and there is no shortage of local food shops. There is also a Lidl in San Gwann not far from St Julian’s Bay. Need some help with property in St Julian’s or elsewhere in Malta? Dragana Rankovic can guide you in your search. Feel free to contact her directly by email or tel: (+356) 79791976. If you’re new to discovering Malta, then this video is worth watching as it gives an overview of the Maltese Islands, its various moods and aspects, and not just of St Julian’s.